For most warehouse owners, optimum use of space capacity and an organized system of goods storage is an important element of improving work or operation flow. Warehouse Racking – Ridg-U-Rack, Inc. Warehouse storage rack systems allow goods to be stored vertically and horizontally on shelving systems such as pallet racks, push back racks and flow racks. The most suitable design and material for a racking setup will be determined by both the load size and weight needing to be stored, as well as the frequency with which it needs to be accessed and restocked or unloaded. 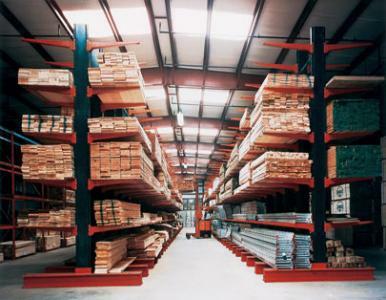 Cantilever racks are ideal solutions for long and oversized products such as piping or lumber. Whereas rolling racks have the additional component of rollers in the arms of the racking systems to aid in moving the loads either forwards or backwards thus using less energy in the overall loading and unloading process. The increased space efficiency in a warehouse or factory is one of the biggest advantages to implementing a warehouse racking system. Land and storage space can be an expensive overhead for a manufacturer and therefore methods in which to maximize existence space are a worthwhile investment. Extra components such as wire grid mesh, guard rails or the addition of wheels can be added if required to a storage rack system. For standard operations however, used racks can often be purchased at a reasonable price from manufacturers no longer requiring their racks. Industrial storage racks are available in a variety of dimensions and materials although most commonly used are strong metals like steel and aluminum. Steel storage racks offer durability and strength which is especially important when used with heavy loads and long term storage facilities. Some warehouses will require forklifts to raise loads to the higher levels of the storage racks, especially for larger loads such as those on pallets. Pallets are a very common transportation and storage item and pallet racks are among the most commonly found warehouse racks in use. They allow for the stacking of palleted loads and easy loading and unloading is achievable with the assistance of fork lift trucks. There are important safety considerations to be followed in the construction of and use of storage rack systems as improper assembly of the structure or improper use such as overloading could have disastrous results for the personnel working with the storage components. Warehouse Racking Warehouse racking is an important storage unit element in many manufacturing and storage facilities for the holdings of goods, products and materials in an organized and accessible fashion.